Chris Hedges gave this talk on revolutionary socialist Rosa Luxemburg on Friday, May 20, 2016 at the Left Forum in New York City. On the night of Jan. 15, 1919, a group of the Freikorps—hastily formed militias made up mostly of right-wing veterans of World War I—escorted Rosa Luxemburg, a petite, 50-year-old with a slight limp, to the Eden Hotel in Berlin, the headquarters of the Guards Cavalry Rifle Division. Copyright 2016 Chris Hedges. First published in TruthDig. 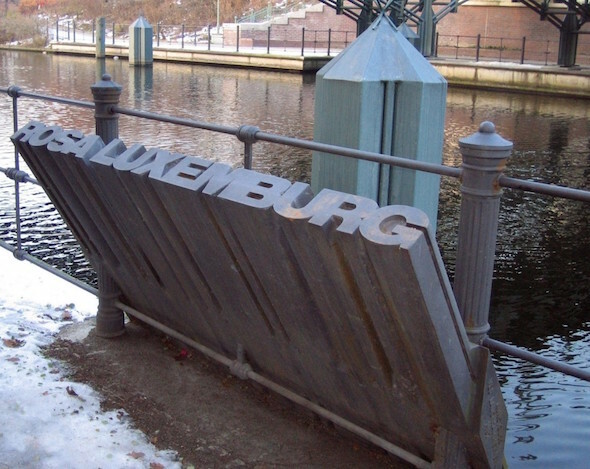 Rosa Luxemburg memorial at the site where she was thrown into the Landwehr Canal, Berlin. This entry was posted on May 24, 2016 by Vox Populi in Opinion Leaders, Social Justice, War and Peace and tagged Chris Hedges, Freikorps, Karl Leibknecht, Moabit Prison, Reform or Revolution, Rosa Luxemburg, Spartacus Revolt.